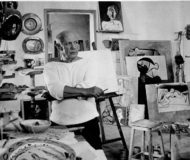 From May 30 to October 12, 2014, Villa Fiorentino will host an exhibition dedicated to the great Spanish artist Pablo Picasso. There will be around 240 engravings graphics, 25 ceramics, oils and unique works of art, etc.. A plunge in the life of a great artist that ranged from drawing to painting, from pottery to ceramics, etc. The event will take place until 12 October 2014, and will be possible to visit the exhibition from Monday to Friday from 10:00 to 13:00 and from 17:00 to 21:00. Description: From May 30 to October 12, 2014, Villa Fiorentino will host an exhibition dedicated to the great Spanish artist Pablo Picasso.